Styles of cats include: sitting, curious, kitten, stylized, alley, mini, happy, and chessie boxes. Styles of dogs include: spaniels, puppy, novelty dog, and scottie. Items include: General line, Connoisseur collection, Supplements, Gift Shop items, Special orders and QVC. Over 325 color photographs, Captions include ware number, year of production and prices. This beautifully illustrated book features over 500 different cats and dogs made by the Fenton Art Glass Company in Williamstown, West Virginia, from 1933 to the present. The book includes many styles that were made in the regular line, sold through the company's gift shop, made for other companies, special orders, and creations that marked special occasions. 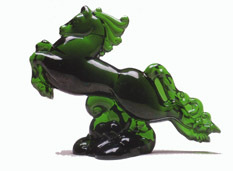 A wide variety of special techniques were used in their production, including hand painting, iridized finishes, satin finishes, and other treatments. 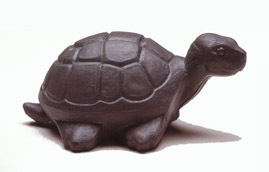 Variations among the mold styles of each cat and dog are explained. Information for this book was gathered from original Fenton catalogs and correspondence with the Fenton Art Glass Company, information from companies that ordered from Fenton, and individual collectors. 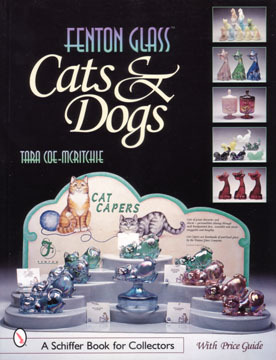 This book is an essential reference for cat and dog lovers and all Fenton glass collectors.